Thank You Michael Scott. Thank You Steve Carell. And Steve Carell bids farewell to Scranton. His final episode as Michael Scott was simple, but touching. Though many might have wanted more, more of the little moments between Michael and his employees, rather his “best friends,” Michael Scott’s and Steve Carell’s finale was just right. It was enough to serve as a thank you, farewell and best of luck to the character and the man behind him, but also keep a sense of realism in the series when many times The Office goes hilariously over the top. The subdued, yet emotionally satisfying episode highlighted Michael Scott. How much he’s grown as a person, how much he hasn’t, how much these people he’s worked with mean to him and how no matter what, when, where, or who, Michael Scott will be that kid at heart. The kid that fill a room with awkwardness and make people cringe, but also the kid that can bring a smile or a tear to your face. And also, the kid that’s a damn good salesman. Michael’s one-on-one goodbyes, checking his best friends off one by one on a list was a wonderful way to see him bid farewell. And ending that list with Pam running to the airport to say goodbye was pitch perfect. Probably the character Michael’s spend the most time with in the office (and likewise for Pam even with Jim), who better than her to be the one that officially sends him off. Couple that with Michael turning to the documentary production crew and asking them to tell him when this six year journey will finally air and then proceeding to remove his microphone pack and handing it over; Not only did it reminded us the viewers that yes, The Office is still supposed to be about a documentary film crew following the everyday life of the employees of a paper company, but it made Michael Scott’s departure official. Sure, it isn’t out of the question that Michael would visit his friends in Scranton one day, but it signaled the beginning of his life without cameras, without the microphones. Without the conference room. His office. It signaled the next chapter of his life. It may seem strange at first to get this deep about a television series that is supposed to be a comedy, but when you have a character like Michael Scott, whom certainly will be entered into the television hall of fame, a character America and the world has grown to love over six years, it is only natural to get sentimental and emotional. It was 2004. The UK and the few in America who had been lucky enough to watch this crazy, hilarious little British comedy about a crazy, inappropriate boss and his employees recoiled at the news that NBC would be adapting the series for the United States. Many British series crumbled after getting translated across the pond and the idea of adapting the lauded and loved The Office, not to mention finding someone, anyone who could give justice to the lead role better than Ricky Gervais of the UK series was unimaginable. But NBC pushed through with the series and believed in the series and here we are six years and seven seasons later. As much as The Office worked because of its creative writing team and exceptional ensemble, Steve Carell was undeniably the glue that held it all together. Though that’s not to say The Office can’t go forward without him. But it will be a very different series. 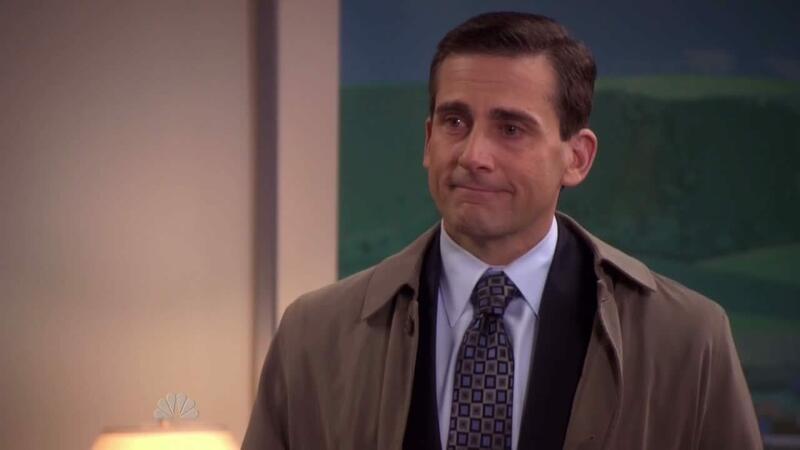 As much as anyone will say The Office isn’t just about Michael Scott, the series indeed have him as the heart and soul. No matter how outrageous Michael Scott could be, he was still the heart of the Scranton branch of Dunder-Mifflin Paper Co.
And that is thanks in large part to Steve Carell’s career performance. It is impossible to imagine anyone else in the role, really anyone else who could’ve helped bring The Office to where it is today. How anyone else could’ve made us laugh, cry and cringe (in a good way) through seven seasons. Congratulations and thank you Steve Carell. For 148 episodes of pure fun and enjoyment. A true class act and incredible talent.